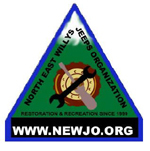 NEWJO is a family oriented Non-discriminative Fun Jeep oriented Club. Our Focus is on Both R’s of the Jeeping world, Restoration and Recreation. In the winter months we focus on technical issues, and in the warmer months we focus on recreation. We offer Orienteering training, First Aid Training, Driver awareness clinics, and Private land for wheeling. Meet and Greets occur throughout the year, rotating ground the states. Anyone can host a meet and greet, tech meet or off pavement excursion. We are law abiding recreation fanatics. Newjo offers two levels of membership, Associate and dues paying members. Dues paying members receive a Club Hat, Membership to United Four Wheel Drive Association, membership in the North East Association of 4 wheel drive clubs, and a window decal. Newjo is all about community and having fun, no vehicle limits, and no discrimination.